There is a reason why Kurt Vonnegut wrote those words. It wasn't because I grabbed his arm and kept him from being run over by a New York City bus. It was because I accepted the assignment from three Hollywood producers of writing a film adaptation of "Breakfast of Champions," and along with my partner and friend, Peter Bergman, wrote the screenplay that I am now -- ten years later -- publishing on the internet. I am publishing it at this late date because I have just seen the film that Alan Rudolph directed from a screenplay which bore no relation whatsoever to the version that Peter and I wrote. I am publishing it because I sincerely disagree with those several critics who dismissed Rudolph's film with the comment that the novel could never -- and should never -- have been made into a film. 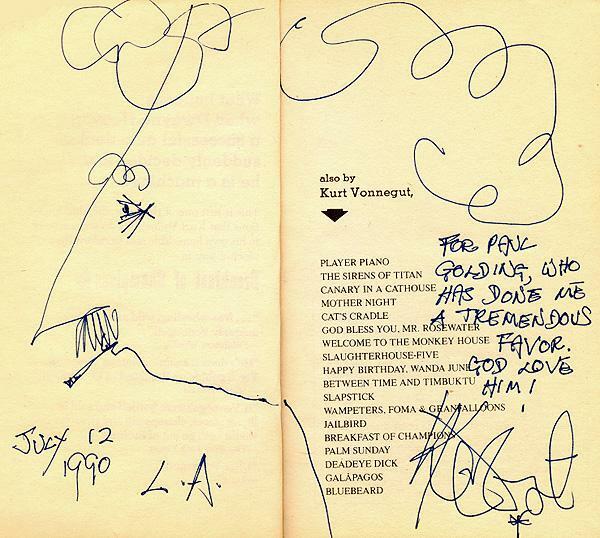 And I am publishing it so that when my children someday sort through my things and come upon the words that Kurt Vonnegut wrote in my copy of his book that they will have some vague idea of why he wrote them.